Among the plaudits being offered following the England cricket team’s trouncing of Australia in the first Test match of the Ashes series, one man, in the humble opinion of this blog, is not getting his due. We agree that it is good news that Ian Bell and Gary Ballance have finally found some form with the bat. Alastair Cook had a tremendous game as captain, showing daring and imagination where before he had demonstrated only caution and rote-thinking. Joe Root, we concur, is surely among the best batsmen in the world; Mooen Ali surely is a match-winner with ball and bat; Mark Wood is a find; Ben Stokes continues to impress; and Jimmy Anderson remains the best swing bowler on the planet. Yet Anderson’s long-time bowling partner Stuart Broad—whose penetrating and accurate spells of fast bowling did so much to set up the defeat of Australia—gets little acknowledgment. In fact, all Broad did was silence (temporarily) those critics who think he should be dropped, and give more ammunition to those who believe he should be pushed down the batting order, and Mark Wood replace him at number nine. Yet Broad—whose batting, it is true, has fallen away dramatically since he was hit in the mouth by a cricket ball—is closing in on 300 wickets, and his average continues to improve as he ages. His speed is back up, his control is excellent, and he clearly intimidates the hell out of Australian captain Michael Clarke. 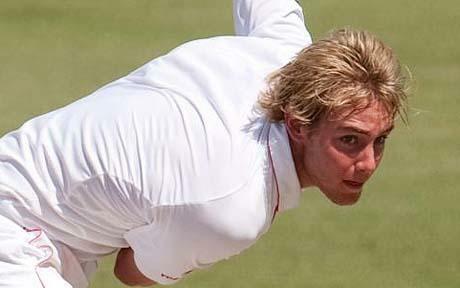 The success of the ODI England team sans Broad and Anderson should mean that a properly rested and fully fit Broad gets a longer time in Test cricket, which, given that he is still only twenty-eight years old, should mean that he will match Anderson as the greatest wicket-taker England have had. Not bad for a problem player! This entry was posted in Australia, Cricket, England and tagged Alastair Cook, Ben Stokes, Gary Ballance, Ian Bell, Jimmy Anderson, Joe Root, Mark Wood, Michael Clarke, Mooen Ali, Stuart Broad, The Ashes. Bookmark the permalink.